JustRite Stampers is excited to announce that Release #1 from Winter CHA is now shipping! There are a lot of great new products in this new release that coordinate with the other products JustRite has to offer. The JustRite Blog Team has been busy creating some great projects to share with you using these new releases. Celebrations Demi Phrases Set 2"
I used CPS Sketch 109 for my inspiration to create my cards. 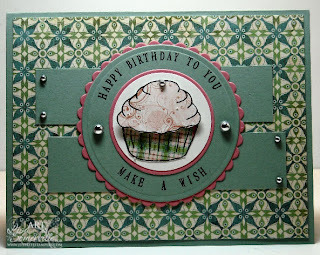 I used Basic Grey Two Scoops Paper and the Paper Piecing Technique to add color to my cupcake icing and liner from the JustRite Wood Stamper 2-3/8" with Bonus 25pt Font & Center, popping the icing piece up on dimensionals. I used my Nestabilities to cut out my Cupcake and the layers under my cupcake. To create the sentiment around the cupcake, I used the JustRite Wood Stamper 2" with Bonus 15pt Font for the Make a Wish and the Celebrations Demi Phrases Set 2" for the Happy Birthday to You. I stamped this in Black on my Mellow Moss card stock and cut with my Nestabilities, then layered on my Regal Rose Scallop also cut using Nestabilities. I created a template for the box that houses my cards. I used the same concept as my cards when creating the image for the outside of the box. Also, be sure to stop by the JustRite Blog daily for other creative projects using JustRite products! Very nice set. The large circle on the front complements the polka dots. Who wouldn't love to have this! How cute. Love the papers you used and the sketch..The stamps really make the card though. Great use of the Demi Phrases on this cute birthday set, Lisa! I love the colors you used. Cute card and box. What a nice gift set you made. The new JRS set w/bonus cupcake is one of the items on my list. What a darling set of cards, Lisa! 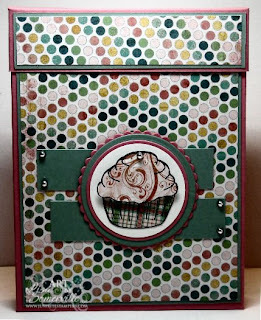 Paper piecing that cupcake is a FAB idea and looks SO yummy!!! Just love the box to present them in!!! GREAT project!!! Such a great set! Love it! Mmmm... yummy! 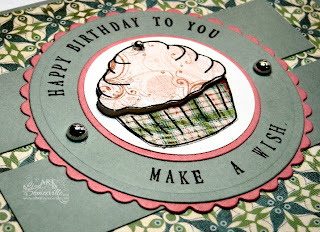 That patterned paper is perfect for piecing the cupcake frosting! Lisa, you card set and gift box are so pretty! Great use of the Demi Phrases! I love all the paper piecing, the cupcakes look so yummy! Wonderful Project!! This should be on the front of a receipe book...awesome. I love Two Scoops paper. Fabulous, Lisa! 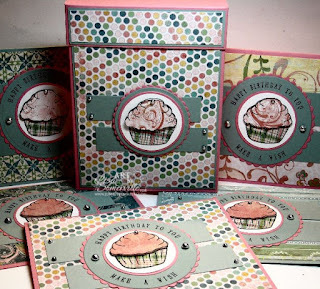 LOVE the cupcake paper piecing idea! And to complete the set by packaging in a matching box is perfect! I can tell you right now that the cupcake set is already on my wish list. I would love to make my grandmother a set of birthday cards with this stamp set. She would love to send cards to friends and relatives made with this! Thanks for sharing. Awesome project! Love those cupcakes! What a wonderful box, and such cute cards! This are great. Love all that paper piecing. Love this set! Love your paper piecing of the cupcake too!